Retired from Air Force 1981, Comptroller 1995. Graduated MJC in 1950, then worked as computer programmer for Mutual of Omaha, entered Air Force in 1951 (Korean War), graduated from Aviation Cadets December 1952 with a commission as a 2Lt and my silver wings. Married Patricia McBrien December 1952, lived in Las Vegas till March '52 then to Suwon, Korea K-13, flew F-86 Saber jets till March '54 and was Squadron Supply Officer. Return to ZI and Great Falls, MT, promoted to 1LT, flew F-84s was Flight Commander then Squadron Assistant Operations Officer, one daughter stillborn, recruited into U-2 program 1956, transferred to Del Rio, TX 1957, U-2 pilot then instructor then standardization pilot. Attended Squadron Officers School Montgomery AL 1958. Promoted to Capt. 1959 then Spot Major in 1960. Flew in Cuban Missile Crisis in 1962, met and showed President Kennedy around U-2, awarded DFC, transferred to SAC Headquarters 1964 as future plans officer promoted to Major. Attended Omaha U. nights & weekends graduating in 1966. Attended Armed Forces Staff College 1967, then assigned Headquarters USAF in Pentagon as future plans officer for reconnaissance both airborne and space promoted to Lt. Col. Assigned Director of Joint Personnel Recovery Center charged with the returning of MIAs and POWs to friendly control. Assigned to HQ SAC as Director of Reconnaissance for Intelligence, promoted to Col. 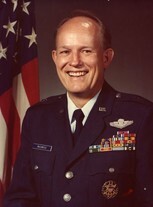 Assigned in 1973 to Grand Forks, ND as Squadron and Alternate Command Post Commander. In 1974 transferred to Cheyenne, WY as Director of Minuteman III Missile operations, graduated from Air War College then on April Fools Day 1975 assumed Command of Francis E. Warren AFB. In 1976 assigned to Malmstrom AFB, Great Falls MT and Assumed Command of that base. Promoted to Brig. Gen. December 1977. Assigned to HQ SAC as Deputy Plans and Policy Director in 1978. Then assigned to Joint Chiefs of Staff, Pentagon, as Deputy Director of Operations for Strategic and General Purpose Forces. Retired in 1981 after 31+ years of service and entered the real estate business as a Realtor for next 14 years. Attended UVA and Completed their CPA program and immediately was hired as a comptroller for a dual corporation and also established my own Tax and Accounting firm. In 1995 I retired, retired and devoted my efforts to charitable work to include preparation of tax returns for the elderly under the IRS VITA program and the AARP TCE program. Also worked with the Knights of Columbus who's only function is charity and with my church as Lector, member of Parish Council and its President the past 4 years resigning this past December. Currently I am a member of my Parish's Financial Council. Also I am currently in charge of a birthday party for one of our Priests, a Christmas Dance for our Parish and the Jubilee celebrating the 25th anniversary of our Parish. My wife Patty and I will celebrate our 58th anniversary this Christmas time. We travel a lot to see our children, grand children, brothers and sisters. Patty is also quite active in all the things I do as well as her own inclinations such as being a greeter at our church, plus caring for the altar linens, and any other job that needs doing. She is also a very skilled crafter. For our Military Officers Association she sends cards to the sick and the families of the deceased. Patty is also the recipient of the Red Cross Gold Star Award. Jerry McIlmoyle McIlmoyle has a birthday today. Jerry McIlmoyle McIlmoyle changed his profile picture.